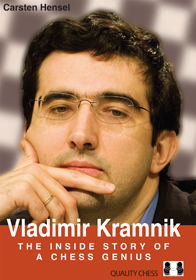 "The present book is both biography and game collection, but [...] emphasizes Kramnik the man as seen by his manager and friend Carsten Hensel during his glory days in the 2000s. Hensel handles the biographical section while Kramnik comments on the most important games of his career. All Quality Chess books feature outstanding production qualities and the present work is no exception. This hardback book with high quality paper is nicely laid out and features many beautiful color and black and white photos. Vladimir Kramnik - The Inside Story of a Chess Genius is the rare chess book which can be read from cover to cover in one sitting." "With many beautiful photos, this is the story by an insider from the team of Kramnik, who after defeating Kasparov in 2000 (which proves his great qualities) successfully defended his title until he had to relinquish it to Anand in 2008. There is a lot of personal information provided by the author. A good informative book."